Dare to Fly!! 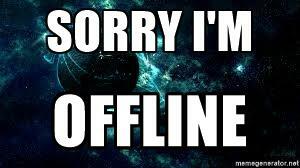 : Sorry, I Am Offline. Switching on the smart phone is the first thing that you do when you get up from your bed. Switching off the mobile phone is the last thing that you do before going to sleep. A sleek and sophisticated smart phone in your hand is a style statement. The access of internet is from bedroom to bathroom. People shop online even from their toilets. We entertain a large number of e-mails, chat notifications, comments and likes every day. The more they are there, the higher is your status. E-mails, facebook, apps, chat, video games have become addictions. Knowingly or unknowingly, we are slave to technology which is a good servant but a bad master. Be always connected is the new mantra of the modern generation. People want to show off that they are busy. Replying e-mails, updating facebook, waiting for other’s reaction on your latest updates have become fashionable. We get irritated if an e-mail or a message does not come for some time. How many mails come to us daily, how many friends are there on the social media and how many likes or positive comments come on our post are matters of social status and professional prestige. We feel incomplete or imperfect without being on-line. We have become an inalienable and integral part of the virtual world. Being always connected keeps your mind unnecessarily busy all the time. You lose your mental peace and emotional balance. Give rest to your mind. Let it relax. Multi-tasking also badly affects the quality of your work. You do not concentrate on one work at a time. You have created your own little world within this vast world. Relationship is seriously affected. You are so engaged in the virtual world that you have no time even for your family and kids. Get rid of this bad habit which is as dangerous as drug-addiction. Sometimes be off-line. You can connect with yourself in a better way. Disconnect to reconnect.